Objective: The obesity epidemic has become a worldwide problem with America leading with 32% of its population considered obese (BMI>30). This is projected to only get worse with 86% of the American population projected to be overweight or obese by 2030 with associated health care spending to be as much as $956.9 billion. Medical therapy has been largely unsuccessful in treating obesity and the associated comorbidities. Multiple bariatric operations are preformed; all with inherent risks and benefits. 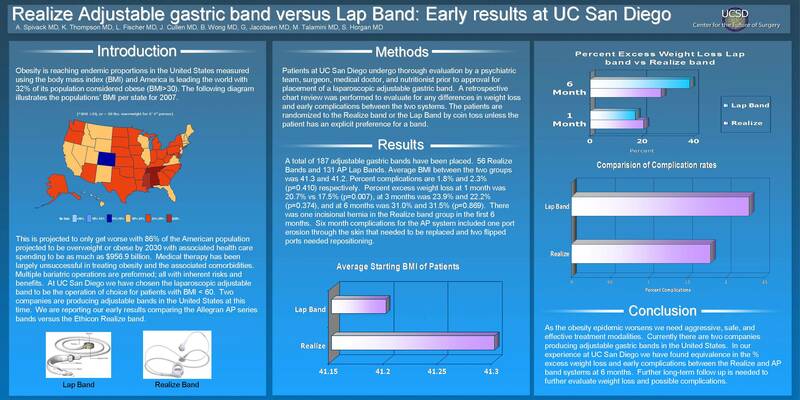 At UC San Diego we have chosen the laparoscopic adjustable band to be the operation of choice for patients with BMI < 60. Two companies are producing adjustable bands in the United States at this time. We are reporting our early results comparing the Allegran AP series bands versus the Ethicon Realize band. Methods: Patients at UC San Diego undergo thorough evaluation by a psychiatric team, surgeon, medical doctor, and nutritionist prior to approval for placement of a laparoscopic adjustable gastric band. A retrospective chart review was performed to evaluate for any differences in weight loss and early complications between the two systems. Results: A total of 187 adjustable gastric bands have been placed. 56 Realize Bands and 131 AP Lap Bands. Average BMI between the two groups was 41.3 and 41.2. Percent complications are 1.8% and 2.3% (p=0.410) respectively. Percent excess weight loss at 1 month was 20.7% vs 17.5% (p=0.007), at 3 months was 23.9% and 22.2% (p=0.374), and at 6 months was 31.0% and 31.5% (p=0.869). There was one incisional hernia in the Realize band group in the first 6 months. Six month complications for the AP system included one port erosion through the skin that needed to be replaced and two flipped ports needed repositioning. Conclusions: As the obesity epidemic worsens we need aggressive, safe, and effective treatment modalities. Currently there are two companies producing adjustable gastric bands in the United States. In our experience at UC San Diego we have found equivalence in the % excess weight loss and early complications between the Realize and AP band systems at 6 months. Further longterm follow up is needed to further evaluate weight loss and possible complications.